?Background? We employed Laparoscopic Assisted Distal Gastrectomy (LADG) for gastric cancer treatment from 1997. 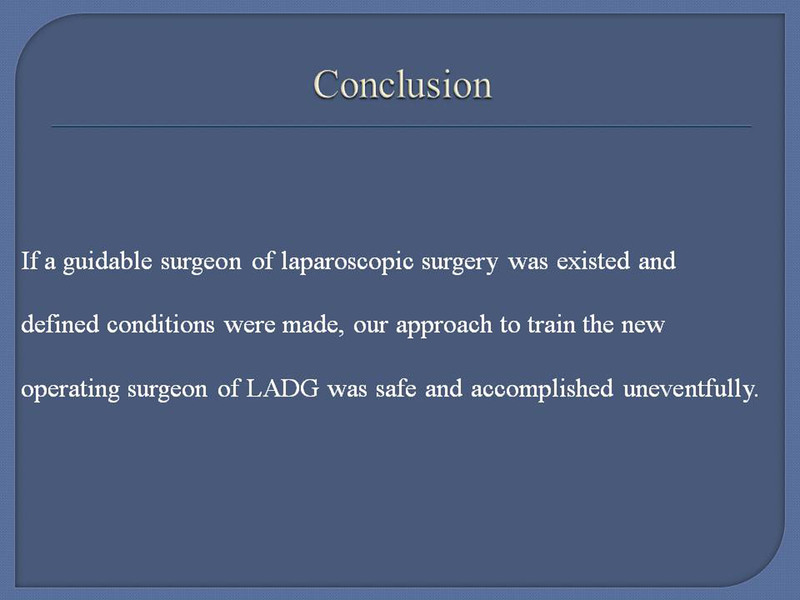 LADG had been operated by only one surgeon (Surgeon A; specialized surgeon in laparoscopic surgery) in our institute. Because LADG procedure has been stylized, we planned to train the new operating surgeons (Surgeon B, C) from February 2007. ?Method? The training of new operating surgeon was conformed to following criteria ( patients factors) 1) Body mass index; less than 23kg/m2, 2) without severe co-morbid conditions. (surgeon factors) 1) participate LADG as an assistant surgeon more than 10 cases before participate as an operating surgeon, 2) Surgeon A must participate new operating surgeon’s LADG as an assistant surgeon for more than first 10 cases. We examined the perioperative data and the postoperative clinical course of 3 surgeons (Surgeon A, B and C), retrospectively. The subjects were 137 patients undergoing LADG between January 2006 and December 2008 in Osaka University Hospital. ?Results? Surgeon A / B / C n=75 / 36 / 26, background characteristics were similar between 3 surgeons, operative time 182±41 / 231±37 / 200±36 min, operative blood loss 97±108 / 126±114 / 125±143 ml, incidence of postoperative complications 17.3 / 8.6 / 7.7 %, Duration of postoperative hospital stay 16.5±10.2 / 14.3±8.7 / 12.8±4.5 days, respectively. There was no case requiring reoperation or transition to laparotomy, and there was no death within 30 days of surgery in any cases. Operative time was significantly shorter in Surgeon A, but operative blood loss, postoperative complications and postoperative hospital stay were not increased in Surgeon B and C. ?Conclusion?If defined conditions were made and a guidable surgeon of laparoscopic surgey was existed, the training of new operating surgeon of LADG was safe and accomplished uneventfully.